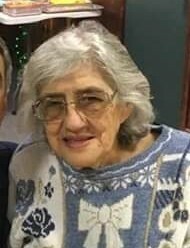 Obituary for Catherine M. (Coppola) Kilgallon | J. F. Rice Funeral Home, Inc.
Catherine M. Kilgallon, 90, of Binghamton, went to be with the Lord on Sunday, April 7, 2019. She was predeceased by her husband, Wesley S. Kilgallon; daughter, Marie C. Underwood; parents, Vincenzo and Maria Coppola; siblings, Vincent “Jim” Coppola, Michael Coppola, Grace (Andrew) Drobot and brother-in-law, Raymond Kramer. She is survived by her loving five children; Sandy (Al) Daniels, Charlene Kearley, Sam (Sandy) Kilgallon, Tom (Laura) Kilgallon and Vince (Cathy) Kilgallon; 17 grandchildren; 23 great grandchildren; three sisters-in-law; Angie Coppola, Joyce Coppola and Eleanor Kramer; and many nieces, nephews and cousins. Catherine enjoyed watching old movies, was an avid reader, loved puzzles and tatting. A Funeral Mass will be offered on Friday at 9 am at SS. Cyril and Methodius Church, Binghamton with burial in Calvary Cemetery. The family will receive friends on Thursday, from 4 - 7 pm at J.F. Rice Funeral Home, Inc., 150 Main St., Johnson City. In lieu of flowers donations in Catherine’s memory can be made to the American Lung Association for COPD Research. Online condolences can be expressed to the family at www.jfricefuneralhome.com.